Children start to pick up sounds and words as they grow up. Then, they try to collect all the correct sounds and speak. This is a process of learning. But sometimes, some children face problems to communicate as smoothly as others and they stutter. Stammering in kids in the early stage of speaking is quite common and nothing alarming. 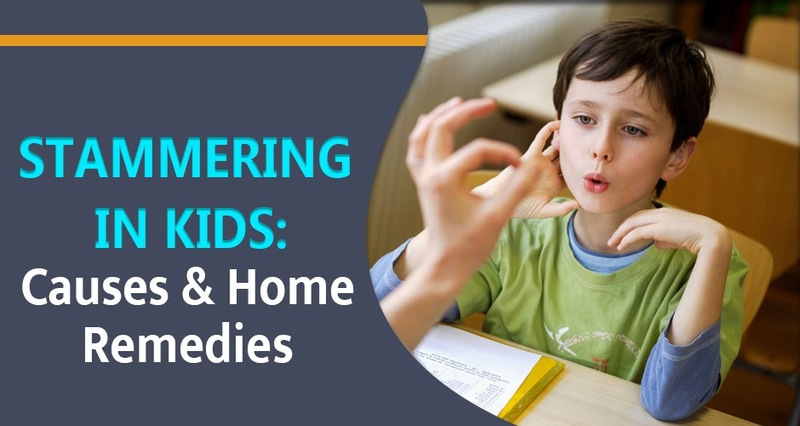 This article aims to help the readers learn the causes of stammering in children and home remedies for it. Stammering or stuttering is the condition when kids face extreme difficulty to speak coherently and smoothly. Usually stammering in kids occurs at the start of any sentence. Kids, then repeat the very first letter many a times before speaking it correctly. However, it can happen within the sentence also. Stammering can occur due to many reasons. Some of them are discussed below. Neurogenic stuttering which occurs when the nervous system needs time to function and react to the receptors. Stammering can be genetic as well. Family history should be checked while treating a child with stuttering problems. Often due to developmental problems in childhood, stammering can occur. Delays in complete development cause stuttering which gets resolved as the child grows up. Children often stutter because they are very exhausted. High energetic activities can tire them out and thus sometimes they can stutter. Often one can notice stammering in kids when they are speaking very fast. The high rate of speech is a very common reason for stuttering. There are many other causes of stammering, also. The syllables sounds of the words are extensively repeated. The noticeable tension in the child’s facial muscle. The kid is 5 years old and is still having problems speaking smoothly. Children can often stammer when they pick up new words or speak very fast. But decreases with time. But if the child is facing problem speaking certain sounds and also this problem is increasing, in that case, it is problematic. Normal disfluency occurs when mind searches for words much faster than the tongue. It is normal and can occur most when the kid is tired or exhausted. But if this occurs for more than two or three months, persistently, then there can be a problem. Chewing and eating Amla, helps kids to stammer less. The speech also becomes much clearer with time. One can make a paste of the almond seeds by grating them. A type of candy can be made with this paste and sugar crystals. Intaking it for two weeks in the early morning can stop the stammering in children. Mixing pepper powder with homemade butter can stop the stammering in children. Keeping a bay leaf under the tongue, while speaking can stop the stammering in children. The gargling of the mixture of fruit pulp of sunflower and coriander leaves for three weeks can stop the stammering in children. There are certain exercises that parents can do with children to stop stammering problems. Parents can ask the child to pronounce every vowel clearly and loudly. Often stammering occurs due to a fast pace of speech. If the children speak slowly, taking pauses between words, this problem can go away. Also, the child will learn how to relax and stay calm. The child should be asked to start breathing from the belly, but not from the chest. This helps to relax the nervous and muscle tensions. It relaxes the entire body and enables the kids to speak much better without stammering. If none of the remedies or exercises work, parents must take the child to the doctor for professional help. But in most cases of stammering, the problem goes away if the children are made to feel relaxed and calm. Parents should worry about the stammering and help their kids develop communication skills at their own pace. It is important for the child to feel important and valued even if the stammering does not go away. Boosting self-confidence in kids despite everything in this type of situation is essential. Also read: Are Ultrasound Scans safe?